C&IT suggests a range of inspiring incentive ideas from across the Asian continent. Piracy on the high seas is always an evocative theme, and in Hong Kong, groups of up to 60 can relive the days of Captain Bligh on a rebuilt 18th-century ship named The Bounty. Berthed in Discovery Bay, Bounty's crew welcomes groups on to the ship, on which they set sail on a five-hour voyage to look for hidden treasures. Participation is the order of the day, with volunteers called on to help the crew raise the sails to maintain the ship's speed, with champagne and canapes replacing a tot of rum as reward. The group learns how to tie to sailors' knots as The Bounty slows down to enter Sok Kwu Wan bay at Lamma Island. Here, the group disembarks for a pirate banquet hosted at the award-winning Rainbow Seafood Restaurant, hosted by Bligh and local pirate Cheung Po Chai. Michael Chiay, director of DMC Ovation Hong Kong, says: "Guests are always pleasantly surprised when they experience this programme, which brings to life Hong Kong's fascinating history of being a trading port. It is also apt that guests enjoy a scenic boat trip since Hong Kong is made up of islands." Any kind of behind-the-scenes private access in China is worth serious bragging rights, and Black Tomato recently organised just such an experience for a group of 70 delegates from a major UK telecommunications company who were in China to attend a global leaders conference. The Forbidden City in Beijing is as dramatic a venue as they come, and Black Tomato managed to negotiate exclusive private access to areas not usually open to the public. For example, the group were given a private guided tour of the Emperor's bedrooms. "As you can imagine, this made the group feel pretty special, particularly as a number of them had visited the Forbidden City before, and this gave them a completely different experience," says Black Tomato director Matthew Smith. The private tour theme continued on the Great Wall, where an area was sectioned off for the group, who walked up to see the views before being summoned for cocktails by a small army of traditional drummers. A martial arts performance by Shaolin monks entertained the party before they were lead to a gala dinner that had been set up on the Wall itself. There's a different approach to the 'school of hard knocks' in Kuala Lumpur on a unique activity giving groups the chance to get energetic, as well as artistic. The city is home to Royal Selangor, the most famous and largest pewter manufacturer in the world. DMC Pacific World has taken corporate groups of up to 80, who spend a day learning about and then mastering the art of pewter-crafting at the state-of-the-art visitor's centre. It may sound sedate, but pewter production entails energetic sessions of hammering out the metal. After some expert tuition from the centre's experts, the group has an enjoyable opportunity to bash out their stresses, after which they should not only feel relaxed, but also - hopefully - have something beautiful to take home with them. Charlotte Weston, regional marketing manager for Pacific World Asia, says: "A highlight that we can organise is meeting the characterful old lady whose family started the business many years ago. As she sups tea with you from the special pewter-ware, she shares fascinating, charming stories of her family's heritage, that make you want to take her and a teapot home." Groups in Tokyo can rightly expect to see something high-tech and futuristic, and the floating bar called Jicoo that sails across Tokyo Bay is one of the most impressive examples of Japan's fascination with all things technological. Designed by Leiji Matsumoto, a famous Japanese anime artist, the ultra cool interior complements the crazy and futuristic design of the exterior and it is billed as a great way for groups to enjoy a reception or cocktail party while taking an unusual tour of Tokyo Bay from Odaiba to Hinode Pier and back. Deacon Ripley, senior business development executive for meetings and incentives at agency JTB UK, says: "Many visitors see Tokyo as a place 20 years ahead of everywhere else for design and technology, robotics and all things futuristic. The floating bar is often used by JTB UK when we are handed a client brief with a modern/science-fiction theme whether it be used as a quirky transfer or bar." Available for exclusive hire, the on-board capacity is for around 200 delegates, and the floating bar has a selection of buffet menus, as well as an 'all you can drink' package. Sentosa is one of the most popular resorts in Singapore, home to a mile-long beach and a clutch of five-star properties and facilities. Since the beach is sheltered, it is the perfect venue for groups of up to 200 to experience the world of dragon-boat racing, a team-building incentive that involves long, oar-powered vessels that are driven along the water in time to the beat of an on-board drum. First of all, groups learn the skills needed to master the art of propelling the boats, then later in the session, it gets competitive with some furiously paced races, all to the beat of the relentless and motivational drum beat. 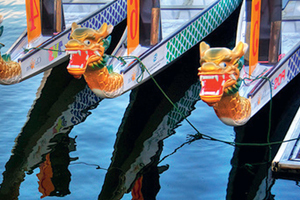 Pacific World's Weston says: "A dragon boat competition is the ultimate adrenaline activity to experience Asia - the beat, the pulse, the tradition and the energy are so intrinsic to this region that it will be an incredibly memorable event for your incentive winners." The event is available as either a half-or full-day activity, and is a great energizer, located at a beautiful beach in tropical waters. There are no losers in this race - a sumptuous local barbecue on the beach is a great reward for the group's efforts. Thai cuisine is enjoying unprecedented levels of popularity, and Bangkok offers large groups a chance to try their hand with a competitive edge and expert tuition. The Ultimate Thai Cooking Challenge usually operates in Bangkok, but can be staged anywhere in Thailand. DMC Diethelm Events has staged this across destinations all across Asia, and IBM and Roche Pharmaceutical are among recent corporates to have enjoyed the experience. Group are split into teams and assigned an apprentice chef to guide them through the programme. Teams then travel by express boats along the river to a local open-air market. At the market, teams have to haggle with stall holders and purchase 26 items to a fixed budget. Teams are then transferred across the river to a kitchen where each has a kitchen top with gas cooker and instructions to prepare eight authentic Thai dishes. "This is an incredibly popular incentive activity," says DMC Diethelm Events executive manager David Barret. "Although we have staged it in various cities across the continent, I feel it really works best in Bangkok."